Springtime is one of my busiest times of the year. I help run a farmer’s market and a kids program at that market, so the couple months leading up to Opening Day is hella hectic! Not to mention it’s one of the busiest times of year for my husband, too; a professor and sculptor. So…our meals tend to be quicker and easier and use fewer dishes — mostly because they’re all piled up in the sink waiting to be washed. This spring-y breakfast (or breakfast-for-dinner) hits that “I want eggs/I want vegetables/But I don’t want to do dishes” spot. It’s all done in just one pan — no separate bowls for whisking eggs or a separate pan for cooking the vegetables. You just cook the vegetables first then break the eggs directly into the pan and stir ’em around (a.k.a. scramble them) as they cook. It’s easy, virtually mess-free, and really good! Crack the eggs directly into the pan on top of the vegetables. Those are some beautifully golden-orange yolks thanks to local, organic eggs! After the eggs cook for a minute or two, stir the eggs, breaking up the yolks and mixing them with the vegetables. Keep cooking — and stirring every minute or two — until the eggs are cooked through and scrambled. I like my scrambled eggs on the creamier side; not overly cooked or too dry. This looks just right! Season with salt and pepper and grate a web of parmesan cheese over top. Serve with some toast and you’ve got a complete, simple, and delicious meal with little clean-up! In a medium-sized skillet, melt the butter over medium heat. 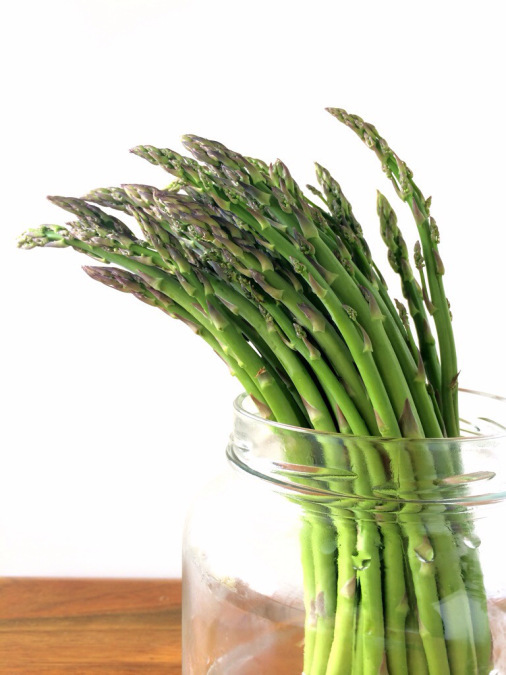 Add the chopped asparagus and cook for 5 minutes, then add the leeks and a pinch of salt and cook for another 5 – 7 minutes, until the leeks are very soft and the asparagus is tender and lightly browned. Crack the eggs directly into the skillet and cook for a minute or two then stir the eggs, breaking them up and mixing them into the asparagus and leeks. Continue cooking and stirring every minute or two, until the eggs are cooked through and scrambled. Season with salt and pepper to taste and grate as much parmesan cheese over top as you like. Enjoy! Oh so yummy! I had asparagus, eggs, onions and Parmesan in the fridge and wanted to make a quick savory breakfast. I found your recipe and gave it a go. My taste buds and tummy are so happy. Thank you for sharing! Awesome, I’m so glad you liked it!!! Thanks for stopping by!